One reason I love places like Old Manali, Goa, Pushkar is the fact that I get to spot awesomely attired people out in the streets. ‘Bohemian’ styling seems to rule the fashion sensibility at these places. Not only this, it also lends (or does it borrow from it?) the laid back element to these lovely places. Whatever the transaction is, the end result is an interesting, quirky and oh-so-stylish agreement on the whole. Each piece of the carefully careless dress-up seems to be looking in different direction, yet it all comes together as a composition. Boho-chic is the ultimate fashion ‘nirvana’ for the wearer, if achieved effortlessly. The free-flowing, multi-layered and comfortable clothing is known as ‘bohemian’ fashion. It, often has ethnic influences that seem to lend individuality to wearer. The grammar of the dressing is that there is simply no rule except for comfort and individuality. What, by the way, is ‘bohemianism’? In the Indian context, there are various ‘bohemian’ communities with temporary dwellings, pitching their tents where the life’s most of the requirements seem to meet. For example, there are communities that perform street-shows involving dance/music and are ethnic to a geography in their roots. ‘Kalbelia’ is one such tribe, for example. The magic is, that bohemians have roots, but can’t be pinned down to a place or a congregation. THAT, I believe, is a common feature amongst all the people (urban, rural, semi-urban) who associate themselves with the bohemian culture. Spotted this person (cross-dresser or a transgender) sporting this attire with an admirable nonchalance and confidence. 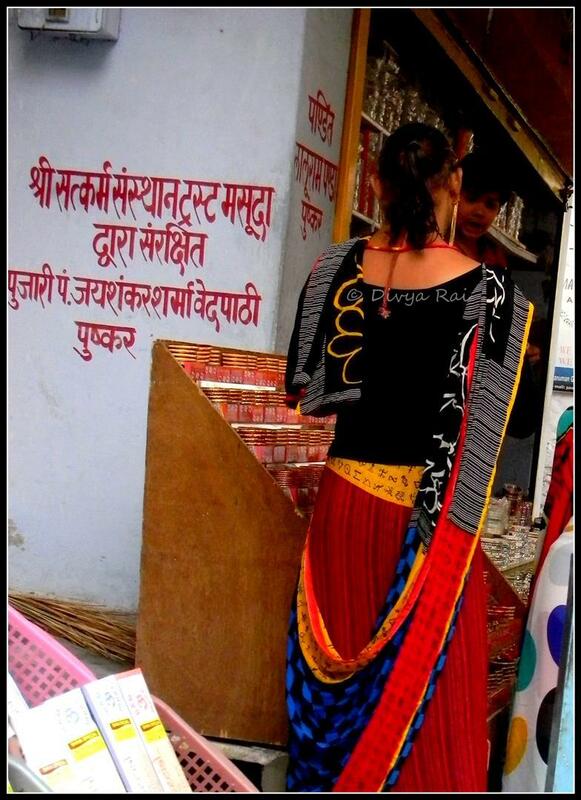 Instead of the traditional blouse, she is seen wearing a viscose T-shirt, coupled with a saree which has interesting fonts/graphics printed as the border. The whole thing seemed to come together beautifully. While it might not look like the quintessential bohemian-dress-up in the first glance, but the bohemian styling these days has much more wider perspective as compared to the era of hippies. A closer look, deciphering the components. Spotting interestingly clad people on the streets is a major attraction for me to travel. The way tourists AND the locals dress-up, speaks volumes about a city/town. For one, the city has to be very zen in its approach towards accepting the touristy influence, for it to become an interesting potpourri of fashion/lifestyle culture.